The rich heritage of Frank’s RedHot dates back to 1918 when pepper farmer Adam Estilette partnered with Jacob Frank in New Iberia, Louisiana, to create a sauce perfectly spiced with the rich flavor of cayenne peppers. Two years later, in 1920, the first bottle of Frank’s Red Hot Sauce emerged from Estilette’s pickling plant. 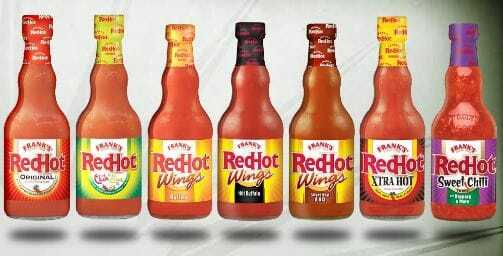 Frank’s RedHot was the secret ingredient used in the first ever Buffalo Wings in Buffalo New York in 1964. All peppers are not created the same. Frank’s RedHot uses a proprietary blend of special, chile peppers to create that surge of flavor that doesn’t obliterate your taste buds. No one else can duplicate the Frank’s RedHot surge of flavor. Frank’s RedHot grows its peppers in both Mexico and in New Mexico. The peppers are then made into a mash and aged/stored in New Mexico. After the perfect aging process has taken place, the pepper mash is sent to our production plant in Springfield, Missouri, where the product is cooked and special spices are added to give your food an unbelievable surge of flavor. The part of the pepper that generates heat is not the colored fruit but the white veins that run along the inside of the peppers. People love spicy foods and our RedHot lovers tell us that they use Frank’s RedHot, not only on chicken wings, but also on foods ranging from pizza and pasta to popcorn and even ice cream. Are you a hot sauce fanatic too? Well checkout some of my favorite Weight Watchers recipe that use Frank’s RedHot! We eat it on everything too! I even put it on my broccoli with a couple sprays of ICBINB spray. mmmmm! I buy it by the gallon at Sam’s! I thought I was the only one! I use Frank’s on everything and am never without at least one bottle of it! I even use it as a dip for my baked Doritos. I haven’t yet tried it on popcorn, but you’ve inspired me to try that as well!